As an ardent student of photography and devotee of the classic black and white photographs by the mid-century masters I practice the medium with an eye toward graceful design. I view each frame as a discreet design project with the objectives of elegance, balance and precision. More images may be seen at www.steveimmelphotography.com. Just after Christmas we received the first of several dumps of snow. 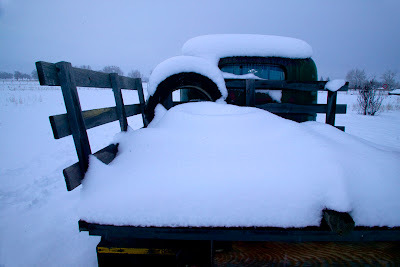 I dashed toward my favorite repository of dead pick-up trucks to score this wintery scene. The blue light conveys the damp chill in the northern New Mexico air. As an ardent student of the mid-century masters I practice photography with the objectives of graceful design, acuity, tonal range and craft. I print full frame as originally composed in the viewfinder. I have had dozens of exhibitions across the United States, in Canada and Europe. My work is represented by Wilder Nightingale Fine Art in Taos and the Taos Historic Museums.